Our cabin is a great place for relaxing. Sometimes we have work to do, but sometimes we just sit back, read, watch birds or talk. Often the birds come to us. I have had a hummingbird hover in the open door, just to check out what is inside that peculiar box on the hillside. We often see waxwings in our big pine trees or catch a glimpse of a goldfinch sashaying by. This past week, a blue jay came to call. It perched on our grape arbour for a while and then examined our ATV trailer thoroughly. I don’t think he had a clue he was being watched and photographed. I love the colour orange. It must be so – it is one of the most used ‘tag’ words in my blog postings. 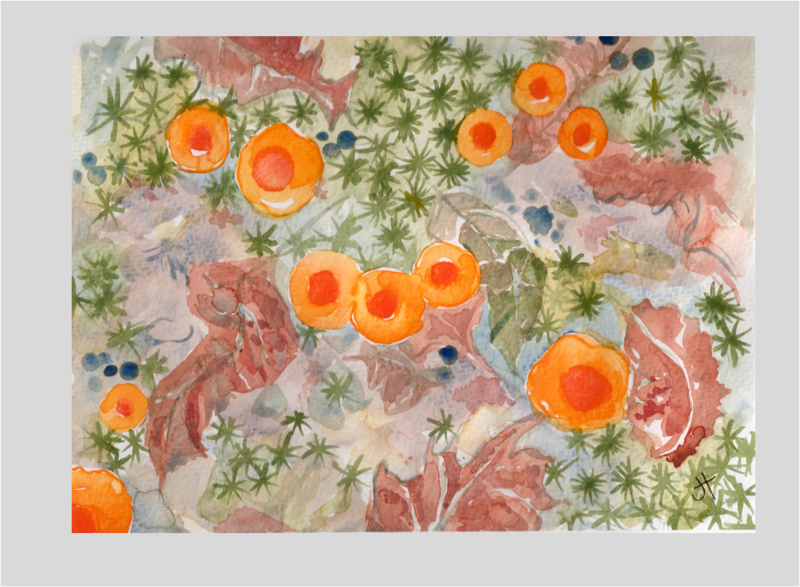 This is a rather whimsical ‘side-view’ watercolour of an orange mushroom I saw recently in our cottage woods. I published the ‘top-view’ in an earlier post.